Underfloor heating offers a brilliant modern alternative to having radiators in your home. Gas Mark 1 have several teams specialised in the installation of underfloor heating. There are many different options of underfloor heating available meaning we can provide you with a tailored design and solution that is best suited for your home. 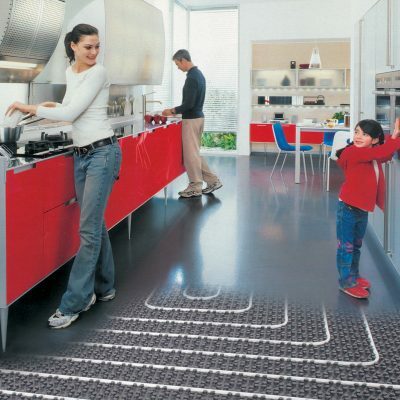 Underfloor heating is a method of warming a room using the principle of heat rising from below. It can be installed in any room and under basically any surface from concrete and tiled to wooden and carpeted flooring. There are two main types of underfloor heating: electric underfloor heating, also known as a dry system, and water underfloor heating, which is also called a wet system. In a wet system water pipes connected to the central heating system are run under the floor evenly around the required area. A thermostat will then be fitted so the area being heating can be controlled and regulated. 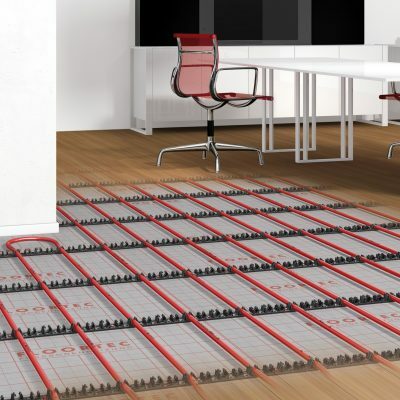 In a dry system, electric cables or electrical mats are fitted beneath the floor, these are then connected to the electric mains supply and controlled via a thermostat. Underfloor heating allows you the luxury of having warm floors even in winter. It can be a more efficient method of heating as the heat is distributed evenly throughout the room, whereas radiators heat an isolated area meaning they have to work far harder to heat the same space. Can save you money on heating bills, as radiators have to be heated to a much higher temperature than the pipes in the wet system. Provides a clean and minimal look, doing away with the clutter of radiators meaning your rooms will have more space in them. Can be expensive to install, due to all the floor having to be lifted. They can be better suited to new builds or extensions to existing property where they can be laid in conjunction with the floor being laid. Can take longer to heat up than radiators as they work at a much lower temperature. If you would like the comfort of underfloor heating in your home, please contact us on 01923 231780 to arrange a free no obligation survey to your property.